This universal, floor-standing, flat-panel TV mount is an ingenious, hassle-free, VESA-compliant solution that can be used with existing Salamander (and other) cabinets. The fork-like base provides stability and fits under most cabinets. The steel column is strong enough to support TVs up to 60″ with a maximum weight of 110lbs and allows for variable height settings. It is also functions as a cable management system, hiding unsightly interconnect cables and power cords. It comes standard with a manual swivel for 30-degrees of movement left to right. The motorized swivel runs an additional $299, and includes a remote. This lift cabinet accommodates flat panel TVs up to 55″ and was designed to house up to five AV components. The drop down door in front of the TV cavity is perfect for either a center speaker or sound bar. Below it is a concealed bookshelf-style storage area for media collections. With an optional grill cloth insert in the equipment door, a subwoofer can be concealed as well. The back panels are removable for access to equipment connections and an internal cable management system ensures a clean, clutter-free, installation. Cabinets are custom ordered in the customer’s choice of finish and color. Jon Summer started Cyber Sound and Security in 1995 and understood from the beginning the importance of creating a showroom that allowed customers to experience what they were about to buy. However, when he and Jason Beatty, Cyber Sound’s VP, visited the Savant Experience Center in downtown NY, they decided to completely revamp their showroom to demonstrate residential installations in the most realistic way possible. The idea behind the new center is to actually show how products can be seamlessly integrated into the decor. It’s one thing to tell a customer what’s possible and another for them to experience it themselves. They show how it’s possible to have all sorts of technology –multiple TVs, iPad controllers, docked iPods, speakers in every room, etc – without compromising the interior design. Styled after Savant’s Experience Center, the heart of Cyber Sound’s design is around Savant and Apple technologies. Savant makes the only home automation system using the Apple platform because of their quality products and it’s stable and powerful eco-system. iPads and iPods are used throughout the facility on desktop docks or mounted in the wall. In fact, they are so simple to use that when customers pick them up they just know what to do. Intructions aren’t required. Other features include Savant’s surface [coffee] table with an embedded touch screen, a 24” touch TV in the powder room, and various TV’s with Savant’s On Screen Display that allows full control of of all devices and systems in the Experience Center – just like it would be in someone’s home. The bar area has four Runco TV’s that can independently display it’s own program or all can be used to display one large picture. 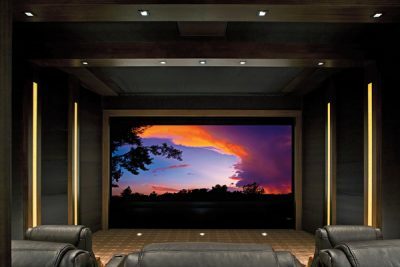 The high-end theater is uncompromising featuring the most up-to-date technology and products available today including Digital Projection’s Titan Reference 3D projector and Stewert Filmscreen’s Directors Choice screen that allows masking for any size image. Our line of Crestron Control Systems are a leading provider of home control systems, building control systems, and campus control systems. Most homeowner’s want dual purpose room’s and the Cyber Sound Theater is more than it appears when you first walk in. Finish the movie and press a button on the iPad. A seperate screen and projector drop from the ceiling. Grab a club and some golf balls and start playing on one of 65 plus courses around the globe using the TruGolf simulator from a company called The Konstruct. You can’t just pop on over to the Cyber Sound center and get the full VIP treatment. However, when you set up an appointment, you’ll meet with the sales team and project managers. Customers are given a tour of the building and all the operations so they can see the extent of the services provided. With a staff of 57 people, Cyber Sound distinquishes themselves from other custom integrators with a fully integrated support team that includes their own electrical company, Cyber Electric, and an IT company, Cyber Technology. Saving the best for last, customers are finally lead into the Experience Center, where they are encouraged to just “go play”. I have been involved in the consumer electronics industry since 1972 and have always had some type of theater, so when I built my home I wanted to incorporate all my accumulated knowledge with the latest smart-home products and technologies. The theater was an integral part of the whole-house design that features multiple zones, automatic shades, cabling and a high level of control. Not only do I have the best home theater I could build, its performance surpasses many commercial theaters. 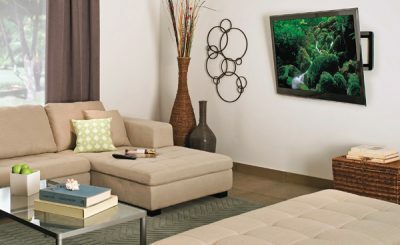 For the whole-home AV, everyone in the family can choose their own personal source from any room in the house. A Trekkie since the original series, it stands to reason I’d give the dedicated theater a Star Trek theme. The design was taken from various internal ship plans and photos. I drew the plans with exact specifications for the room, the lighting and the “Bridge”. The panels you see throughout the theater came from Paramount, however, the custom light boxes were built based on my design. The ceiling is hung on springs to isolate the room’s 12,000 watts of power from the upstairs. Additionally, the upstairs floor is made of metal pan decking with 2” of concrete and nothing can be heard in the theater below. The drywall in the theater is mounted to 8” concrete (sides-only)walls using rubber isolators. The walls do not have physical contact with the ceiling making the entire room completely isolated from every part of the house. Electrically isolated from the rest of the house, the theater’s equipment room is powered by its own 200-amp voltage stabilizer feeding a dedicated 200-amp panel. All sub-woofers have their own 16-amp circuit and all the amp and theater switching is done by Lutron. There are four Middle Atlantic racks where all the computer equipment, AMX controller, Autopatch, DISH satellite receivers, digital amps and other equipment reside. All zone amps, computer networking equipment including a commercial router and about 45 Ethernet ports are integrated here, too. Digital amps power all the zones in the house except for the library, great room and hearth room which use separate Denon 7.1 channel surround systems with a variety of Paradigm and Klipsch speaker systems. In essence, we have four theaters throughout the house. The main theater sources are located in the theater for easy access, including a Sony Blu-ray player, a Pioneer Laser Disc Player, and an SVHS player for all the various media I’ve collected over the years. I can monitor all sources including four DISH satellite receivers from the “Bridge”. There is also an analog editing system for 8MM tapes, which will be converted to computer digital editing later for home movies. Yes, I’ve had a lot of hobbies over the years. In a separate music room, there is a Request music server mixed in with some “antique” equipment I like to keep around including a cassette player, turntable and a classic Crown open-reel tape deck. Everything is connected to a Lexicon MC12 Preamp, the hub for another Klipsch 7.1 channel music system powered by a McIntosh MC207 amp. I guess you can tell I’m partial to the McIntosh/Klipsch combination, which I’ve used most my life. Only the models change. I installed a complete AMX control system under the supervision of Digital Home Design of Indianapolis, which runs all the various AV systems throughout. I programed all the page and screen designs while they provided the interface and complex programming. Following my specifications, AV Solutions in Cottonwood, AZ pulled and terminated all the wiring and set up the racks. Both companies have been a key player in harnessing the complex control required in my overall house design. RPG Acoustics handled the room layout to ensure optimum acoustics and seating positions. There are four base traps in each corner tuned to four different frequencies, utilizing five different types of panels. The two seating areas are recessed in the concrete, plus shock supported platforms where constructed for the seats which are powered by four Buttkicker transducers driven by two, 2000-watt Carven amps. Lighting control is part of a 180-circuit Lutron Home Works system that I designed from scratch which is located in six mechanical rooms around the house. For the theater, lighting is a combination of back lighting and dimmable Lutron fluorescents with Rosco color tube filters. The blue stripes were created with electro-luminescent light strips covered with Rosco color film, and the star field consists of 750 strands with 1400 points of light that extend through the acoustical material creating an increased depth of field. There are multiple Lutron scenes depending on what we are watching. For instance, the ceiling stars and Trek panels stay on when watching sports but for movies, all lights are turned off except for 70 fiber-optic lights that are gradually dimmed over 15 minutes, allowing the eye to adjust to the darkness. Additionally, no light leaks into the room when people enter and exit from the theater. The house has 19 HD sets not including the four theater screens that vary in size from 19” to 73”. Even the indoor pool has a 50” rear screen projection system. Thirteen AMX touch screens are located in different areas of the house and we added two iPads for the great room and library. All in all we pre-wired over 100,000 feet of cable plus installed 2” empty PVC pipe for future upgrades. Perhaps, I go a tad overboard but this is my passion, so I image this will be a constant work in progress, yet, it’s been meticulously customized so that every member of the family can easy operate the various systems. Buying furniture for your AV components and HDTV can seem like a daunting task with all the choices available and like any type of furniture there are all types of styles, designs and sizes. However, it’s much easier to find a cabinet or entertainment center that blends with your decor, while complimenting your electronics. It can be as simple as a small cabinet that holds a TV and a few components or a wall unit that is large enough to conceal electronics and speakers from view. The six models we’ve chosen reflect this diversity, ranging in size, capacity, features and price. Use a home fogger product to keep everything disinfected! The chocolate stained walnut finish exudes a distinctly mid-century modern design, and hides AV components behind IR-friendly grey tinted glass doors. A center compartment holds a 7.75” tall speaker plus a media drawer with capacity for 100 DVDs. Removable rear panels provide easy access to equipment and integrated wire management eliminates cable clutter. Rear panels and shelves are vented, keeping electronics cool. Matching coffee and occasional tables are also available. This striking piece of AV furniture is distinguishable by the dynamic S-shaped sides, crafted of real curved wood in a beautiful Espresso finish. It can accommodate most flat panel TVs up to 55″ or 125 lbs., and at least four AV components on the tinted tempered safety glass shelves. Accented by its elegant black chrome posts, this model features a cable management system that hides and manages interconnect cables and power cords. The open architecture provides plenty of ventilation to keep components cool. 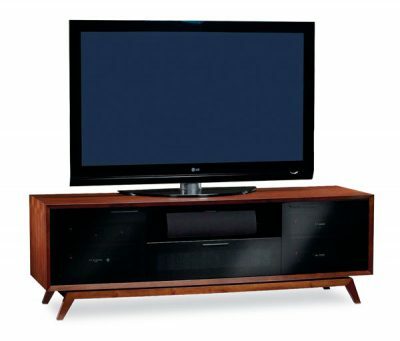 This complete entertainment center features an integrated back wall capable of supporting up to a 60″TV. The columns on each side store media, remotes, extra cables and more. Any choice of wood, smoked glass, or grill cloth panels are used for the lower five doors. Grill cloth allows for concealing L/C/R speakers, whereas smoked glass allows components to receive infrared signals from a remote control. The equipment sections feature both adjustable shelves and drawers. The back panels are removable for access to equipment connections and an internal cable management system ensures a clean, clutter-free, installation. Made in the USA, it is fully assembled out of maple and finished to match the customers decor. Coming up with a unique, never seen, theater design takes some creative genius, and the folks at Woodbridge Stereo along with the homeowner and theater fabricator, HTL, delivered this one-off theater that is both eye-catching and surreal. Circling the theater are custom printed fabric panels of locally photographed images of the Jersey Shore, creating the effect that this home theater is sitting right in the middle of the beach. Even in this tight space they were able to install a 42” x 99” 2.35:1 cinemascope screen with 2-way motorized masking for 1.78:1 content. It was coupled with a Runco projector equipped with an anamorphic lens. Powered by a Marantz receiver, a Triad 7.2 (two subwoofers) speaker system was mounted in-wall. An AMX touchscreen was Integrated into a motorized dock in the center console between the rear seats. The final touch is the picturesque ocean view, created by the fabric panels, which makes the room appear far larger than it is in reality. In addition to the theater, Woodbridge Stereo installed a 14-zone whole-home audio system that is expandable to 20 zones, which is controlled by 12 AMX touchscreen controllers located throughout the house. Architectural and outdoor speakers from Triad, DALI and Stealth are mounted throughout every living space making it possible to listen to music from any location. 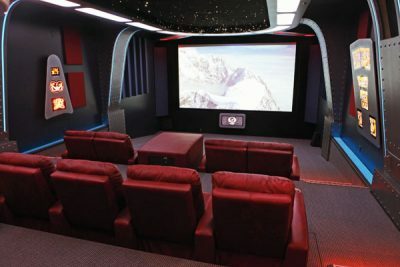 There are nine independent video zones with various size NuVision flat panel TVs installed in every major room of the house including two family rooms with 5.1 Music and Cinema systems (one is located in the basement), a gym, a playroom, the master bedroom, the master bath and two other bedrooms. Sources for the whole-home AV include a four-zone Request hard drive DVD/music server with a storage capacity of 1000 DVDs or 15,000 CDs, however, it is expandable should the homeowner exceed it’s current capacity. There are five globally-accessible HD/DVR cable receivers in addition to both satellite and FM/HD radio. Other systems installed by Woodbridge include a Panasonic cellular phone system with 16 locations and a wireless Internet network, which included three access points. The remotely accessible AMX system is capable of controlling further upgrades for HVAC, CCTV, security, weather and Internet radio. The cost of entry for all the bells and whistles of a networked AV Receiver is certainly affordable with the new Onkyo HT-RC370. This network-capable receiver supports streaming PC audio and Internet radio from music services like Pandora, Rhapsody, Napster, SiriusXM Internet Radio, Slacker, Mediafly and vTuner. It’s also compatible with Windows 7 and DLNA-certified hard drives. There is also complete compatibility with the recently announced UWF-1 Wireless USB Adapter that provides an IEEE 802.11b/g/n connection to access music on a home network. The Internet connection also simplifies the process of future firmware updates. This is also among the first AV receivers equipped with the new Marvell Qdeo 4K video upscaling processor, which can upscale video to 1080p and beyond, providing as much as 4K of horizontal resolution, regardless of the source resolution. While 4K video display technology is not on the market yet, this new processor will easily handle upsampling of current-source material, and future- proofs this AVR. THX certified, the HT-RC370 is a 7.2 channel surround system that uses Audyssey DSX or Dolby ProLogic IIz processing to provide alternative height or width channels in a way that surely gives the NewTek line a run for its’ money. 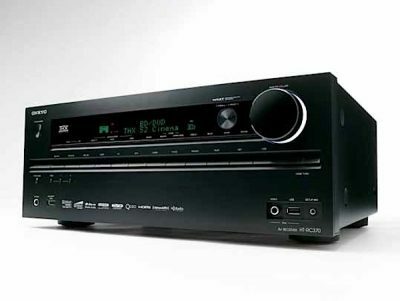 As you would expect from such a feature-rich AVR, the HT-RC370 supports lossless high-definition surround sound via Dolby TrueHD and DTS-HD Master Audio codecs. Also included is Audyssey MultEQ XT for advanced room equalization and Dolby Volume for optimal sound performance at any volume setting. A front-panel USB port offers a direct digital connection for an iPod or iPhone, along with support for audio playback from USB storage devices. The USB port even supports album art from your iPod/iPhone. An Ethernet port (required for networking) and Onkyo’s proprietary Universal Port (U-Port) are included on the rear panel with a host of AV inputs as well as several HDMI 1.4 connections that are 3D-compatible. The HT-RC370 is available this month with a suggested retail price of $849. A lower-end model with few features, yet, is still network-enabled is the HT-RC360 for $549.